In this set of tutorials, we are going have a look at the steps required to build your own EMI (Eucalyptus Machine Image). An image is a fixed collection of software modules, system software, application software, and configuration information that is started from a known baseline (immutable/fixed). When bundled and uploaded to the Eucalyptus cloud, this becomes a Eucalyptus machine image (EMI). Each of the images – EKI, ERI, and EMI – have associated XML files that contain meta-data info about the corresponding images respectively. There are two types of EMIs provided by Eucalyptus, instance store-backed and EBS-backed. In this set of tutorials, we will be looking at steps for creating both of them. In this tutorial, I am going to create a custom CentOS 64 Bit EMI. NOTE: If your Eucalyptus Frontend does not have Internet connectivity, then no issues. You can follow the following steps to create a local yum repository on it. This will help you to install most of the necessary packages for your EMI. Its quick and simple. If you already have the requirements in place then proceed directly to the CREATE YOUR EMI section of this tutorial. 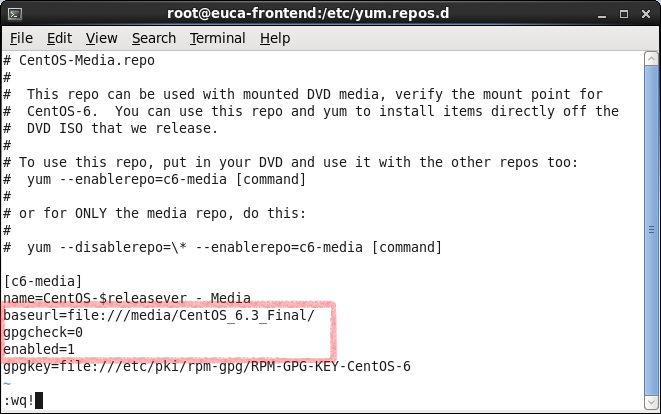 Next step, is to edit our Local Repository file, in this case, its called as CentOS-Media.repo. These Repo files are typically found at /etc/yum.repo.d/ directory. 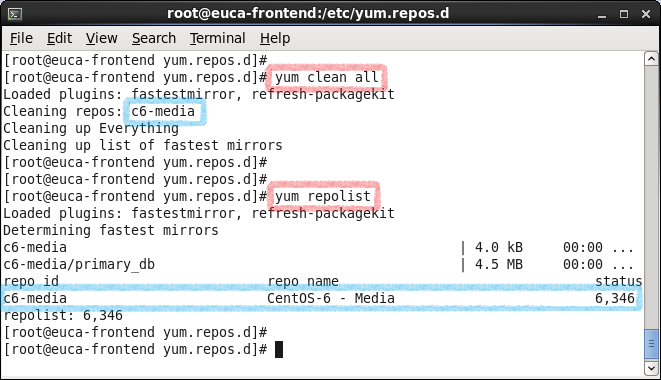 Once done, edit the CentOS-Media.repo file using any editor tool. You should see an output similar to the one shown below. The repolist command will list the RPMs present in the ISO file (roughly 6,000 of them, depending on the CentOS ISO version as well..) If this returns error, then make sure your CentOS-Media.repo file does not contain any errors. Once done, you care now ready to create your first CentOS EMI.